“Man At Work” is kind of a tricky episode of Black-ish. You see, the cold open is almost atypically serious, as Dre voiceovers about “taking care of your own” and coming up from nothing. It’s all stuff the show has talked about before, but with the exception of the Entourage cast photo that’s thrown in, it’s an episode opening with very little levity. But by the time we get to present day Sha (Faizon Love) and his slovenly appearance on Dre’s couch, it’s easy to forget all about that introduction and how atonal it feels. In fact, it manages to be the standard manic vibe of Black-ish—with solid gags like large posters dedicated pitas due to “a perfectly understandable homonym error” and the devolution of Mr. Stevens (who starts the episode looking like a preppy villain from an ‘80s teen movie) all happening around the edges—for about 75 per cent of the entire episode, which is why the ending and farewell to Charlie hits like a ton of bricks. It feels strange to admit it, but I can now say that one of the most poignant scenes to come out of Black-ish so far is from a character who brings his gun to work and is afraid of a little girl twin. I’ll willingly admit that I teared up at the Charlie farewell scene. In fact, the end tag with Rihanna’s “Stay” retroactively made it even harder, despite that actually being played for humor, pratfalls and shoe-string belts and all. The combination of the impending lack of Deon Cole on the show (as the scene never makes it feel like there will be an 11th hour save and return to the status quo) and the understanding of the honest gravity in the scene just hit me in an emotional place. Plus, there’s the fact that the episode doesn’t really play Charlie’s last scene for hard laughs, even when Charlie is leaving on his scooter and talking about unrefrigerated meat in the copy room. That’s a first for the character, and it makes it all so much realer. “Man At Work”s ending is realy a bit of a bait and switch: In all of the talk about about staying true to your crew and having their back, the assumption going into the episode is that all will be well in the Charlie plot and the Sha plot will be the one where the episode’s emotional beats come out, most likely in the form of tough love from Dre. That tough love never comes in that form though, and as the show counts down to what will seemingly be the sweeping emotional moment between Dre and his childhood friend and protector, it actually happens in the Dre/Charlie plot instead. After all, Charlie is Dre’s adult friend and protector at this point. Plus, Sha’s storyline is more tied with the kids and Bow. If this is the last we see of Charlie for awhile, at least this episode does right by him. The revelation that he’s actually secretly good at his job is great, as it makes the underlying question of how he still has a job finally make sense, even in an office as unprofessional as theirs. Assuming for most of the episode that Charlie’s job is going to be saved and he’s going to stay, the knowledge that he’s a rainmaker means there would never have to be a reason to worry about Charlie’s job ever again. But then logic sets in once Charlie realizes that he’s on the chopping block, with his numbers at the company meaning that anyone even entertaining the idea of firing him is reason enough for him to take his skills elsewhere. However, the fact that he’s secretly competent at work doesn’t make the flashbacks of actual scenes of Charlie being unprofessional less funny. That’s the way we should all remember him. From a storytelling perspective, the best thing that could happen for the Sha plot did happen: It’s necessary for the character to actually make something of himself, especially after this season’s Halloween episode with Michael Strahan. Dre’s past can’t just continue be a punchline, and he can’t be the only one that “makes it” without that becoming a slippery slope. The episode luckily realizes that and has Sha come out on top and Dre mostly be right about him the whole time. Yes, Sha is a slob, but throughout the episode, he always has paint on his clothes, which pop culture has taught us implies actual art work and possible talent. And his brief phone video of Zoey shows some creativity too, so the episode is smart to make it clear that he does have talent. However, considering how lazy and flat-out disgusting Sha is in this episode, it’s almost too unrealistic to truly believe that there is actually a method to his madness the whole time. Then again, that lack of realism here is made up by the end to the Charlie plot. On the plus side, Faizon Love does perfectly well as Sha… but it really is a character you’ve seen at least a dozen times in television and movies, only with actual talent in the end. Luckily, the plot absolutely brings out the best in Bow and some fun from the kids, who are the real sheep in this entire situation. The fact that the kids all manage to fall victim to Sha’s philosophy proves that they’re not as savvy as they think they are—even Diane—and it’s all worth it for Bow’s tough love speech at the end of the plot. 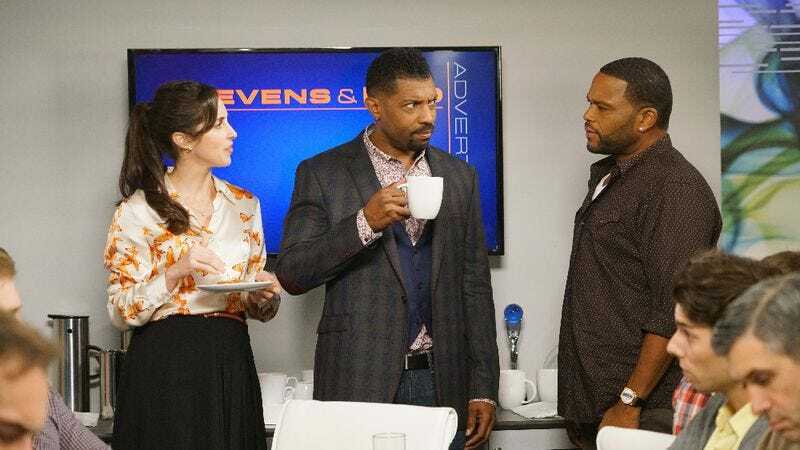 Again, it’s Bow being put in the role that could easily transform into nagging wife, but Black-ish doesn’t even try to pretend that she’s at all wrong or playing on the same stereotypical field as that—especially given her past cult experiences—and her increasing annoyance with the influence of Sha paired with Dre’s chill demeanor works out quite nicely. The same is true when you take into account Dre’s increasing annoyance paired with Charlie’s chill demeanor over at the office. It works so well, you’d never even notice that neither Pops nor Ruby are in this episode. That’s what we call working very well. I’m assuming the reason Charlie is being written out is because of Deon Cole’s commitment to Angie Tribeca. If not, I’ll just be in the corner, crying some more. Of course, I have to praise Wanda Sykes’ role as Daphne Lido in this episode, and her character actually does “shake things up” for the show. Hopefully the recurring role continues to yield such great results. By the way, ABC’s copywriter should be fired, if the introduction before this episode is any indication: “Wanda Sykes drops by, and she’s girl bossing.” No. Dre: “He’s not a terrorist, Bow. He’s an artist.” I’m honestly surprised that line stayed in, given current events. Lucy: “Pour a little out for our homie?” The silver lining of no Charlie is more Lucy, right? Sorry, Blockhead.